As you know, my latest ebook, Crochet Dynamite: Gifts for Your Besties is out! Yippee! It's a collection of 8 great projects that are perfect for gift giving to all your best girlfriends. It includes 5 of my free patterns, one of my paid patterns, and 2 ebook exclusive patterns! The cross-body bag pattern alone sells for more than the price of the ebook, so it's a really great deal! But I've got an even better deal for you! In honor of it's launch, I've got a special treat! 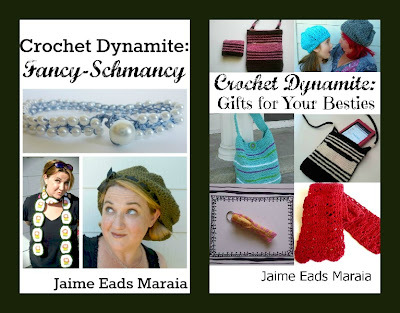 Today BOTH of my books, Crochet Dynamite: Fancy-Schmancy and Crochet Dynamite: Gifts for Your Besties are FREE in the Kindle store! Yes! FREE!!! All day long!! If you enjoy them, would you consider leaving a positive review on Amazon? It would really help me out, and it doesn't cost anything but a couple of minutes of your time. And if you really do NOT enjoy them, would you mind sending me an email at CrochetDynamite@gmail.com telling me what I could do to make your experience with them better? I am still new to this self-publishing thing, and while I do my very best to make sure that I am turning out a high quality project, I appreciate all feedback that you have to offer. Please feel free to share this offer with all of your crocheting friends and family members! Save yourself $1.98 and grab them today! Thanks Jaime! Stay safe tonight. Thanks Piper, I will! You too, okay? Congratulations on your latest book release and wow, thanks for the generous offer. I will download and get ya some feedback. Happy Halloween to you and your family. Thanks Karen! I hope you and your family had a fun day yesterday too! Thanks so much for your generous gift! Now. All I need to do is figure out how to access them on my iPad. I am looking forward to making some of the patterns. I think the Chapstick thingies will be first! Hi Diane! Yay! Let me know how it goes! Hi Sue! I hope you and your family are safe! I wanted to send you an email, but I don't have your address. When you get a chance, shoot me an email at CrochetDynamite@gmail.com and I'll see what I can do to fix this for you!